Along with most other wine lovers, owning a vineyard must be my ultimate fantasy. Just a small parcel of land would do of course. Preferably attached to an attractive old house. Near the sea if possible. But while it remains a dream for me, it’s a reality for former Cornish fish merchants John and Kim Coulson, who own Polgoon Vineyard in Penzance. When they bought the land in 2002 they knew nothing about winemaking. And, by their own admission, they’re still on a steep learning curve (although they got lots of advice from the Lindos up at Camel Valley). Their first vintage was in 2006, much to their amazement, they won the Waitrose trophy for best still rosé in the UK Vineyards Association awards. Then disaster struck and rain wiped out next two harvests. While many might have thrown in the towel, the Coulson’s looked to their orchard for inspiration and began producing a Champagne-style cider that became an instant hit. Along with the Pologoon Aval (Cornish for apple) they now make a pink fizz, Raspberry Aval, a Peren (Cornish for pear) made using the méthode traditionnelle and a Champagne-style Elderflower sparkler for the River Cottage. Luckily, their 2009 grape harvest was good, so they’ve also returned to making wine too. Like Camel Valley, they do tours and tasting. But we decided to rock up unannounced since we regularly passed the cellar door to and from our rented cottage. We met John who said we could wander around the rows of vines at our leisure. He also explained there wasn’t an awful lot of wine left to taste, as most of the 2009 vintage is sold out. 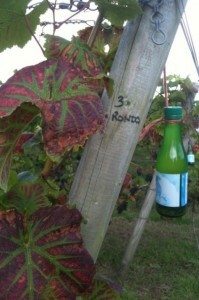 But we did sample the Raspberry Aval which was light, bubbly and summery. We also tried the 2009 rosé, which I found a bit too acidic on its own but I imagine would go nicely with local crab. But hey, it’s only their second vintage and John seemed hopeful that the 2010 will be more mellow. 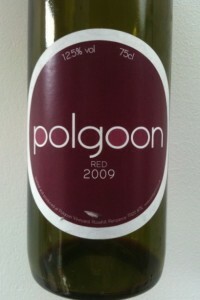 We subsequently tried the Polgoon Red 2009 after we found two of the last bottles at Scarlet Wine in nearby Lelant. It had a lovely nose of brambles and blackcurrants and tasted like ripening victoria plums and nettles. Then the blackcurrant flavours came through and it reminded me a little of a Loire Cabernet Franc. I think making red wine in England must be a tough challenge given our climate and I have yet to try one which matches the quality of the whites. But I thought the Polgoon Red was the nicest I’d tasted so far, and I’d prefer to sip this on a Summer’s evening than many a tart rosé. As with most other English wine makers, Polgoon’s products are not cheap if you compare them to wine from countries with low labour costs, vast, flat vineyards and government export subsidies. We paid just shy of £13 for the red. But you can’t compare them as it’s not a level playing field. 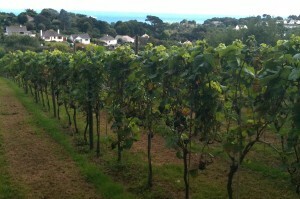 Most English vineyards here are small, on slopes and are labour intensive to maintain. I would argue that just as a lot of people are prepared to pay more for their locally produced food then they should feel the same way about their wine. But they don’t. “It will be too expensive for my customers,” said the owner of my local wine shop when I asked him about stocking English wines. A couple of days later, a friend said similar. Too expensive. So, forget the prejudice of people not trying English wine because they think it will be rubbish. I think they still avoid it because of its perceived value against wines from other countries, and that’s where the industry needs to win over hearts and minds – because I want to see more Polgoons springing up in the South of England adding to the choice and diversity of the wines available here to drink. Who knows? It might even bring down the cost. There are so many cheap wines but there are also very good wines to which might cost you bit more but they have really amazing taste and flavour. Polgoon’s products are not cheap if you compare them to wine from some other countries. But still its good deal.